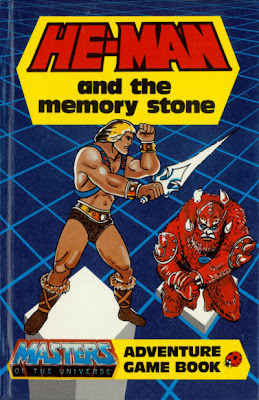 He-Man and the Memory Stone is a 1985 Masters of the Universe “adventure game book” written by Jason Kingsley, devised by Roger Hurt, and illustrated by Judith Wood and David Glen. Here, Skeletor drains Man-At-Arms’ memories, and He-Man sets out to get them back. This is a choose-your-own-adventure-style book in which the reader makes choices for He-Man; He-Man also has hit points, which he can lose in various ways. It’s notable that is the only He-Man book of its kind, and, given its audience, it does a few things well. The book rewards common-sense choices; there’s very little guesswork involved as to whether a particular decision is the smart one. The die-based combat isn’t all that difficult, especially compared to something like the Advanced Dungeons & Dragons Adventure Gamebooks (which, admittedly, were for a substantially older readership), although hit point loss is mostly due to unlucky rolling rather than bad choices. In short, you have to be either really unlucky or persistently stupid to get killed, and it rarely feels cheap. And the serial Ladybird canon discrepancies are minimal here. There’s not a great deal of art here, as text boxes fill most of the pages. However, most of what there is is fair. I was surprised to discover that Robin Davies’ name isn’t on this book anywhere; a great deal of the art looks like his work. While it may not be the pinnacle of the genre, He-Man and the Memory Stone is a worthwhile diversion for He-Man fans. Read it HERE; you’ll need a die to play.